About The Official Spaghetti Bolognese Recipe. 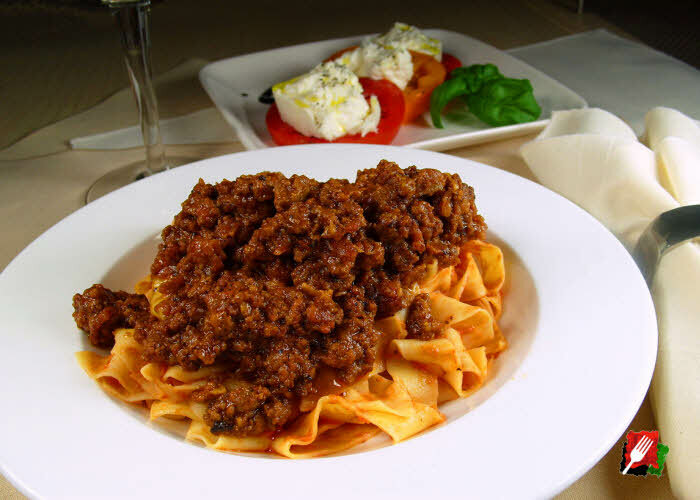 Bolognese originated from Bologna, the capital city of the Emilia-Romagna region in northern Italy. What some people don’t realize is that Bolognese is a meat sauce – not a tomato-based marinara or tomato sauce. Since Pellegrino Artusi first published his recipe for Ragù alla Bolognese in 1891, there have been very few changes to the original list of simple ingredients: Beef, pork (pancetta or bacon), onions, carrots, celery, milk, broth, a bit of tomato paste, a little wine, salt and pepper. 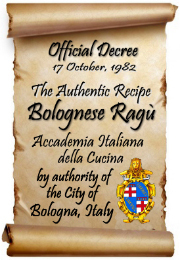 The City of Bologna commissioned the Accademia Italiana della Cucina – the Italian Academy of Cuisine – to research and certify for historical purposes the one and only authentic Bolognese recipe. With a solemn decree issued on October 17, 1982, the official recipe for classic Bolognese was notarized and deposited at the Palazzo della Mercanzia in the city of Bologna, Italy. As the official Bolognese recipe below specifies, authentic Bolognese is primarily a meat sauce that contains very little tomato, and there isn’t any garlic, no oregano, no basil, no parsley, no bay leaves, no rosemary, thyme or sage, no anchovies, no fennel or star anise, no lemon zest, no cinnamon or nutmeg, no sugar, no peppers, no chili sauce or hot pepper flakes – none of the myriad ingredients that many people might use in their bolognese recipes today. A good Bolognese sauce also only takes a few hours to make – not standing over a hot stove all day like many Bolognese recipes call for that can cook away much of the flavor. 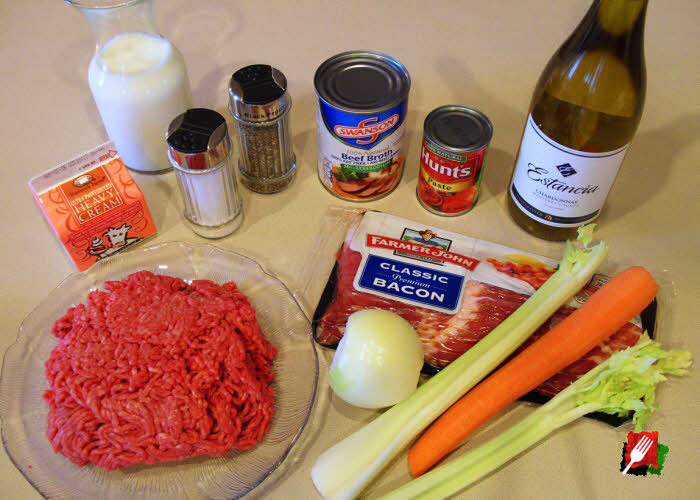 There are a variety of Bolognese recipes, and some prefer the added layers of rich tomato, herb, and zesty Italian flavors found in newer Bolognese-style recipes, but for the Bolognese purist, the following is the only official authentic Bolognese recipe1 you can make. And while the official recipe provides all of the ingredients, it delivers few details on how to properly prepare it. After months of trials, we’ve developed the following comprehensive preparation details that maintain complete integrity for the official Bolognese recipe, and delivers both authenticity and incredible taste. 1. Finely chop the pancetta (or unsmoked bacon), onion, carrot, and celery, then set aside. Preheat a large skillet or Dutch oven over medium heat. Add the chopped pancetta or bacon. Stir until golden and the fat has rendered for the vegetables, about 5 to 10 minutes. Stir in the onions, carrots, and celery, then sweat with the pancetta until the onions are slightly caramelized and the vegetables start to soften and are translucent but not browned, about 10 minutes. 2. Season the ground beef with salt and pepper, then add to the pan and increase the heat to medium-high. Stir the beef for about 15 minutes, breaking it up with the back of a spoon, until browned and its oils sizzling. Scrape the bottom of the pan, if necessary. Then add 1 cup of whole milk and stir constantly until the milk has almost completely evaporated, another 15 minutes. 3. Stir in the wine2 and let it reduce for about 10 minutes, then mix the beef broth with the tomato paste and add to the pan. Continue to cook on medium-high to high until it comes to a boil, stir, then immediately reduce the heat to low and let the sauce cook uncovered at a very slow simmer that is bubbling lightly. Stir often (about every 10 to 15 minutes) and add the remaining milk a little at a time until it slowly thickens and the rich, orange oils start rising to the top, about 2 hours. 4. When the bolognese is almost done, stir in 2 tablespoons of heavy cream and give it a taste. Freshen with a pinch of salt and freshly ground pepper if needed. Now would be a good time to separately start cooking the pasta water. Turn up the heat to medium, stir and cook the sauce for another few minutes uncovered until it starts bubbling. The bolognese is finished when the deep orange fat rises to the top and the sauce has a rich tomato appearance. Use an immersion stick blender if you prefer a smoother sauce. Pair This Delicious Bolognese With A Great Pasta. Make your Bolognese sauce even better by pairing it with a flavorful pasta hearty enough for the dish. The “official” Bolognese pasta called for by the City of Bologna is tagliatelle pasta. Tagliatelle (pronounced talia-telly) are long, flat ribbons similar in shape to fettuccine, but slightly larger, measuring about 3/8″ in width. Another good pasta would be 1/4″ wide fettuccine, dome shaped orecchiette, or (our favorite) the wider 3/4″ pappardelle pasta. Selecting any of these four pastas would be an excellent compliment to this Bolognese recipe. For tagliatelle or fettuccine, dry pasta is fine. 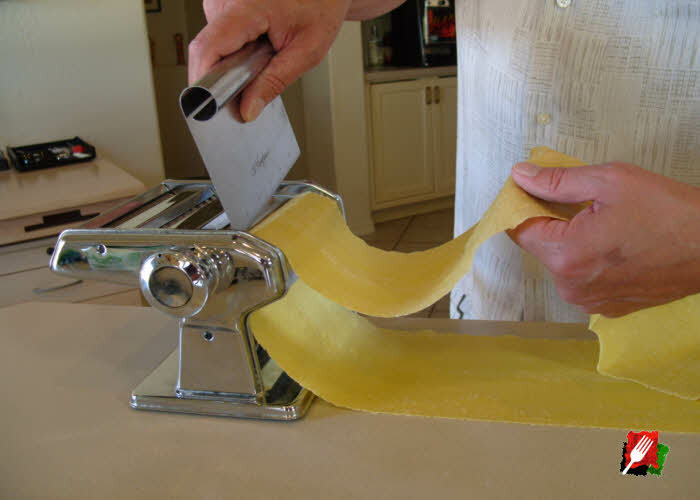 If you’re using a heartier pasta like pappardelle, go with a fresh egg pasta rather than dry pasta if possible. Fresh pasta contains richer tasting eggs and flour, while dry pasta is produced with just semolina flour and water. You can make your own homemade fresh egg pasta or you can purchase fresh egg pasta at many finer supermarkets. Use the finished Bolognese as a pasta topping, or for a more traditional Italian dish, toss the pasta cooked al dente in the same skillet as the Bolognese sauce to coat all of the pasta ribbons evenly. Then plate it up and top with a little extra sauce, add freshly shredded Parmigiano Reggiano, and garnish with a small leaf of fresh Basil. This Bolognese sauce is also great in lasagna! Freeze any unused sauce1 for later use. You will find very few recipes more delicious and flavorful than this authentic Bolognese dish. 1This Official Recipe Has Been Doubled. Freeze Any Unused Portion. The ingredients for this delicious Bolognese recipe have been doubled from the amounts specified in the official recipe on file in the city of Bologna, Italy. Preparation times have also been adjusted accordingly. The extra Bolognese is perfect to accommodate family, friends, leftovers, or even freeze for later enjoyment. Pop any leftovers in the refrigerator for up to 2 days, or to freeze any unused portion, let it cool within 2 hours after cooking, securely seal in a freezer bag, then freeze for up to 2 months. 2Should I Use Red or White Wine? 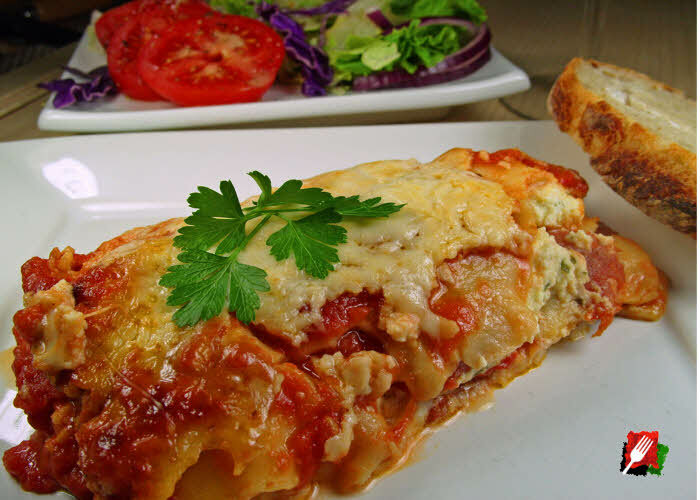 Adding wine delivers an added layer of flavor to your dish. The official Bolognese recipe is quite forgiving, allowing either a dry red or white wine (not sparkling) to be used. While either is acceptable, many prefer white wine for its added brightness that can’t be achieved with red. Chefs in the Emilia-Romagna region of northern Italy and others including Mario Batali, Marcella Hazan, and Lidia Bastianich all prefer the sharp, zesty, and fruity flavor of a good dry white wine like Chardonnay for their Bolognese, while in southern Italy, many prefer the richness of a dry red wine like Cabernet Sauvignon. Still can’t decide? Alternate the recipe by using a nice dry white wine one time, and a rich red wine the next. You won’t be disappointed with this delicious Bolognese either way you decide to make it!